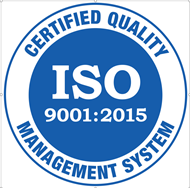 Metal Industries is proud to announce that our Marion, NC manufacturing plant has achieved ISO 9001:2015 certification of it’s quality management system. After an exhaustive quality system audit, Perry Johnson Registrars, Inc. (PJR), a UKAS and ANAB Accredited management systems certification body, has verified that Metal Industries North Carolina facility conforms with the requirements necessary to achieve this distinction. Metal Industries has long been dedicated to providing a quality product and to keeping our customers and their needs at the forefront of all we do. ISO 9001:2015 certification effectively demonstrates our continuing dedication to quality and customer satisfaction above and beyond the normal practices of uncertified organizations. By demonstrating our dedication through certification, the 70-year-long reputation of Metal Industries, Inc. is further emphasized and acknowledged – a boundless commitment to our customer and to providing a quality product on time, every time. Please see the official PRESS RELEASE from PJR. Perry Johnson Registrars, Inc. is dedicated to differentiating itself as an effective provider of certification services, as well as ensuring that we create value for our customers, industry stakeholders, and employees. PJR understands the importance of impartiality in carrying out its management system certification activities, manages conflict of interest, and ensures the objectivity of its management certification activities.